Zero Dark Thirty is, unfortunately, being swallowed up in controversy before the vast majority of audiences have the chance to see it for themselves. The torture debate is worth having, but only once people have seen the film. And this is a film that should be seen, many times if possible. Not only does it tell a thrilling, saddening and fully realized story of the years spent searching for Osama bin Laden, but through the eyes of Jessica Chastain (who, as you can see below, gives the best performance of the year), the film represents the specific fear and mood of post-9/11 America. That fear defined by knowing so much, living in the information era, having incredible ways to secure oneself, and yet being at a loss. Terrorism hurt the lives of those directly involved in the tragedies of that day (and too many days since), but for everyone else, it left the mark of uncertainty. And Zero Dark Thirty, being the masterpiece that it unquestionably is, understands that while one evil man's death may give us certain catharsis, it cannot wipe clean that mark. Once Amour settles into the apartment where its main, elderly couple resides, it does not once leave. The suffocation of setting matches the ties between a man and his dying wife. 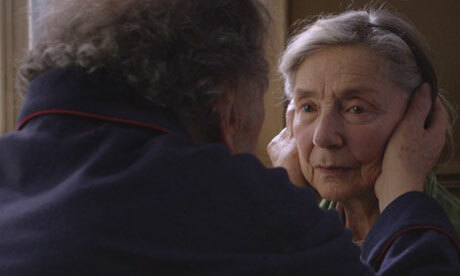 Jean-Louis Trintignant and Emmanuelle Riva simultaneously bring out the cruelest and kindest aspects of humanity. As Riva passes away, slowly and painfully, her performance becomes exceedingly difficult to watch. Though he retains most of his physical faculties, Trintignant shows these dynamics through his care of Riva. While some have seen the title as irony (given that this is a Haneke film), its sincerity is even more brutal. There is love between these two, but just as the human body decays, time cannot maintain what once was. As Riva's body deteriorates, so does Trintignant's patience, and thus, their relationship. This film is gorgeous and painful in equal measure, just like its titular subject. Beasts of the Southern Wild is a remarkable effort, even if you are unaware that it is director Benh Zeitlin's first feature film, and contains a cast of first-time actors. When you throw those facts on top of the beautiful film, this movie that pulses with the sharp heartbeat of genuine passion, the result is stunning. Quvenzhane Wallis gives an incredibly pure performance as Hushpuppy, a girl surrounded by death and beauty. She captures the magical realism of the film with her wide eyes and repetition of the film's wonderful, empowering centerpiece line: "In a million years, when kids go to school, they gonna know: Once there was a Hushpuppy, and she lived with her daddy in The Bathtub". This line, that willful ignorance and simultaneous embrace of the cruel reality surrounding her, sums up Beasts perfectly. The movie reminds the audience that no matter what may happen to us or who we may lose, we all long to be remembered, to live on far past our expiration date.